Have you ever wanted to have sensors scattered all around your house and garden reporting their temperature regularly to a central server? Then, this IoT project might be the solid launching point for you! 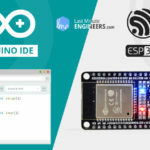 This project uses ESP32 as the control device that easily connects to existing WiFi network & creates a Web Server. 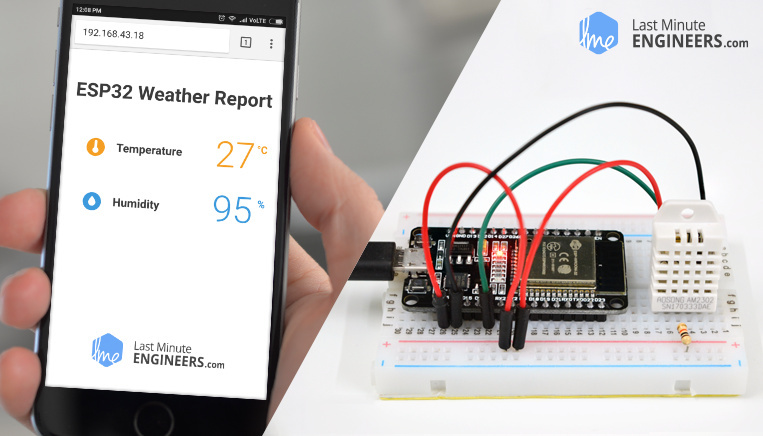 When any connected device accesses this web server, ESP32 reads in temperature & relative humidity from the DHT11, DHT22/AM2302 sensor & sends it to the web browser of that device with a nice interface. Excited? Let’s get started! 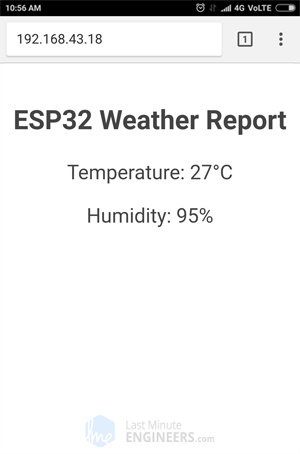 If you didn’t know, ESP32 comes with an internal temperature sensor having a range of -40°C to 125°C. The temperature sensor generates a voltage proportional to the temperature which is converted into digital form via an internal analog-to-digital converter. As per ESP32 datasheet, the problem with this temperature sensor is that, the offset of the sensor varies from chip to chip due to process variation. Also the heat generated by the Wi-Fi circuitry affects temperature measurements. So, the internal temperature sensor is only suitable for applications that detect temperature changes instead of absolute temperatures. However, you can achieve accurate results by calibrating the temperature sensor and using ESP32 in a minimally powered-on application to reduce CPU temperature. But the results will never be as accurate as with inexpensive temperature sensors like DHT11, DHT22/AM2302. Connecting DHT11/DHT22/AM2302 sensor to ESP32 is fairly simple. Start by placing the ESP32 on to your breadboard, ensuring each side of the board is on a separate side of the breadboard. 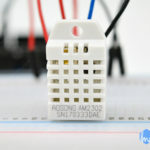 Now place the sensor on to your breadboard besides ESP32. 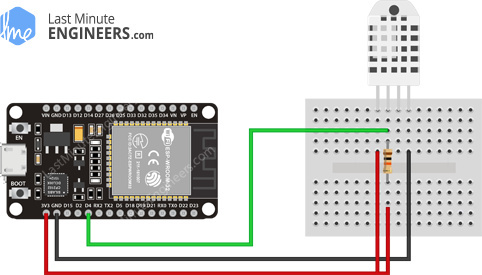 Connect VCC pin on the sensor to the 3.3V pin on the ESP32 and ground to ground. 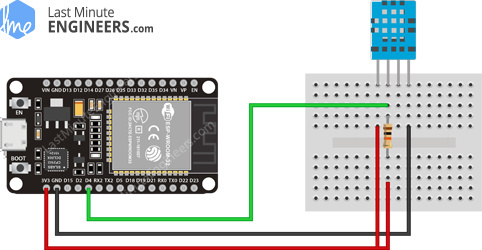 Also connect Data pin of the sensor to D4 pin on the ESP32. Finally, we need to place a pull-up resistor of 10KΩ between VCC and data line to keep it HIGH for proper communication between sensor and MCU. If you happen to have a breakout board of the sensor, you need not add any external pull-up. It comes with a built-in pull-up resistor. Communicating with DHT11, DHT22/AM2302 sensors is a bunch of work, as they have their own single wire protocol for data transfer. And this protocol requires precise timing. Fortunately, we don’t have to worry much about this because we are going to use the DHT library from Adafruit which takes care of almost everything. 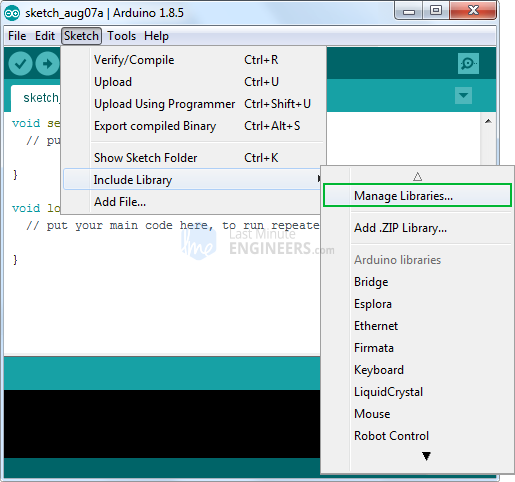 The library is so powerful that it runs on both Arduino and ESP architecture. 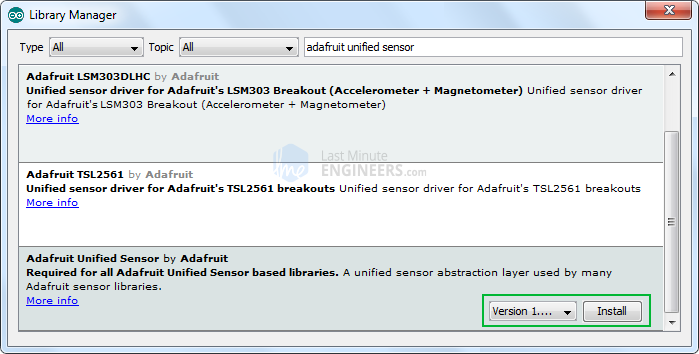 Filter your search by typing ‘DHT sensor’. There should be a couple entries. 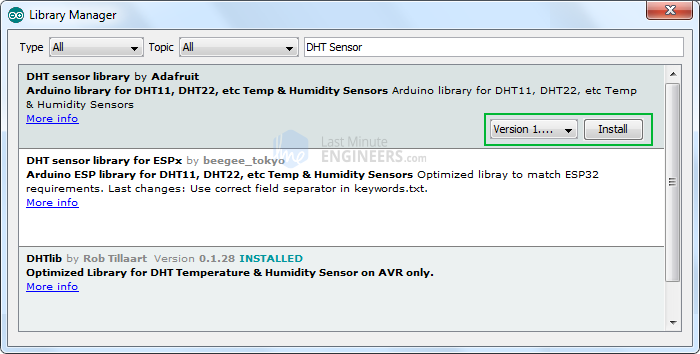 Look for DHT sensor library by Adafruit. Click on that entry, and then select Install. As the heading suggests, we are going to configure our ESP32 into Station (STA) mode, and create a web server to serve up web pages to any connected client under existing network. Once you are done, go ahead and try the sketch out and then we will dissect it in some detail. 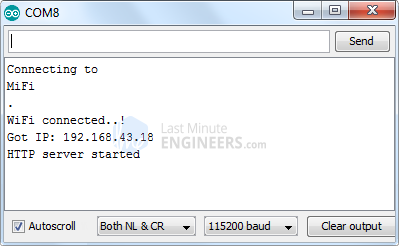 Next, load up a browser and point it to the IP address shown on the serial monitor. 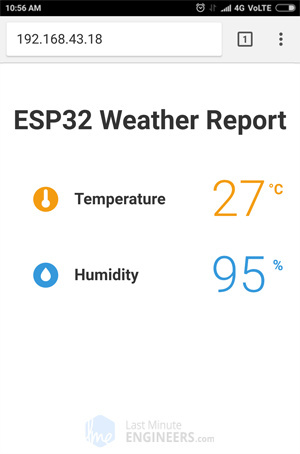 The ESP32 should serve up a web page showing temperature and relative humidity. The sketch starts by including WiFi.h library. This library provides ESP32 specific WiFi methods we are calling to connect to network. Following that we also include the WebServer.h library, which has some methods available that will help us setting up a server and handle incoming HTTP requests without needing to worry about low level implementation details. Finally we include DHT.h library. Next, we need to define the type of DHT sensor we are using. Uncomment one of the lines below accordingly! As we are configuring ESP32 in Station (STA) mode, it will join existing WiFi network. Hence, we need to provide it with your network’s SSID & Password. Next, we need to define the ESP32’s pin number to which our sensor’s Data pin is connected and create a DHT object. So, that we can access special functions related to the DHT library. Two float variables viz. Temperature & Humidity are declared to store respective values. Inside Setup() Function we configure our HTTP server before actually running it. First of all, we open a serial connection for debugging purpose and set GPIO ports to INPUT. We also need to initialize the DHT object using begin() function. Next, we need to create a function we attached to root (/) URL with server.on. Remember? At the start of this function, we get the values of temperature and humidity from the sensor. In order to respond to the HTTP request, we use the send method. Although the method can be called with a different set of arguments, its simplest form consists of the HTTP response code, the content type and the content. In our case, we are sending the code 200 (one of the HTTP status codes), which corresponds to the OK response. Then, we are specifying the content type as “text/html“, and finally we are calling SendHTML() custom function which creates a dynamic HTML page containing values of temperature and humidity. 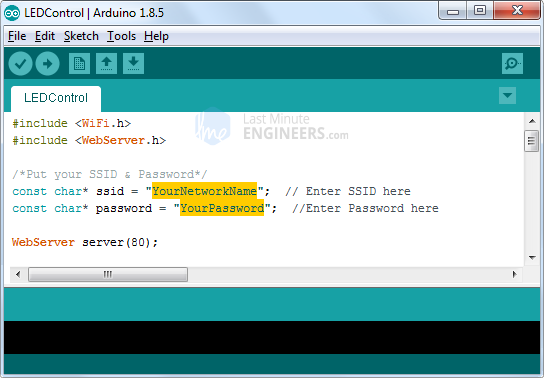 SendHTML() function is responsible for generating a web page whenever the ESP32 web server gets a request from a web client. It merely concatenates HTML code into a big string and returns to the server.send() function we discussed earlier. The function takes values of temperature and humidity as a parameter to dynamically generate the HTML content. Pretty amazing, Right? Without further ado, let’s apply some style to our previous HTML page. To start with, copy-paste below code to replace SendHTML() function from the sketch above. Try the new sketch out and then we will do its detailed breakdown. We already know that <!DOCTYPE> declaration tells the browser we’re sending HTML code and the <meta> viewport element makes the web page responsive. The only addition here is we are going to use google fonts. Google has hundreds of web fonts and are free for commercial and personal use. Perfect! We will use Google commissioned Open Sans web font for our web page. Google font is embedded using link tag in <head> of your HTML document. We have selected 300 (Light), 400 (Regular) & 600 (bold) font weight for our page. You can select as many as you want but keep in mind that selecting unnecessary font weights hamper page load time. You can also add italic style by just adding i character at the end of font weight e.g. 400i will embed italic style. Note that you cannot see Google font, without active internet connection on the device, you are going to access this page. Google fonts are loaded on the fly. Next, we are going to apply ‘Open Sans’ font for our whole HTML. We also need to specify sans-serif as our fallback font, to ensure maximum compatibility between browsers/operating systems. If the browser does not support the first font, it tries the next font. Next, we need to apply CSS for Humidity & Temperature – icons, titles and actual values. All these three things are made inline and aligned vertical. Background of icons is made circle using 50% border radius and made 30px height and width. Next, we will show temperature readings with this nice little icon. The temperature icon is actually a Scalable Vector Graphics (SVG) defined in <svg> tag. Creating SVG doesn’t require any special programming skills. You can use Google SVG Editor for creating graphics for your page. After the icon, we are going to show the actual value of temperature from the sensor. Next, we will show humidity readings with this icon. Again it’s a SVG. After printing humidity values, we are going to end all the open tags like body and html. When readyState is 4 and status is 200, the response is ready. Now, the content of element with id webpage (div holding values of temperature & humidity) is updated.